As I ease back into school tomorrow, I thought it would be helpful to ease my students back into the school routine as well. 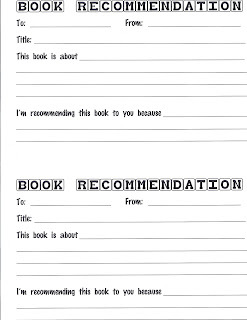 I developed a quick and dirty book recommendation form that I will introduce to them tomorrow. I plan to copy the recommendations onto bright paper and give two to each student. My goal is for students to think about two particularly wonderful books they have already read this year and then think about what other 4th grader at school would be a great match for the book(s). After working through a sample together, explaining and modeling how you would give a quick 2-3 sentence description of the book without giving away anything crucial as well as giving a reason for the recommendation, students will have the rest of the week to complete the two book recommendations for homework. Recommendations will then be given to the students they were written for.